UKRAINE PUT ITS forces around Crimea on high alert today, as tensions soared after Moscow accused Kiev of attempting to mount armed incursions into the disputed peninsula. Russia’s FSB security service said yesterday it had thwarted “terrorist attacks” in Crimea this week by Ukrainian military intelligence and beaten back armed assaults, but Kiev fiercely denied the claims. The allegations ratcheted up the heat in a feud sparked by Moscow’s 2014 seizure of the Black Sea peninsula from Ukraine and raised fears of a wider conflict. The UN Security Council was to discuss the growing tensions later today at the request of Ukraine, a non-permanent council member. Ukraine’s pro-Western President Petro Poroshenko met his top brass and ordered forces along the frontier with Crimea and across the conflict-wracked east onto “high-alert level”. Russian President Vladimir Putin also met security chiefs to discuss “additional measures for ensuring security for citizens and essential infrastructure in Crimea”, the Kremlin said. Scenarios were carefully considered for anti-terrorist security measures at the land border, in the waters and in the airspace of Crimea. Meanwhile, a NATO official told AFP the US-led military alliance was monitoring the heightened Crimea tensions with concern. The official, who asked not to be named, said that “Russia’s recent military activity in Crimea is not helpful for easing tensions”, and called on Moscow “to work for calm and de-escalation”. Russia’s FSB security service said one of its officers was killed in clashes while arresting “terrorists” overnight on 6-7 August, while a Russian soldier died in a firefight with “sabotage-terrorist” groups sent by the Ukrainian military on 8 August. Putin angrily accused Kiev of “practising terror” and warned that the deaths of the Russian officers would have consequences. Russia’s foreign ministry reiterated today that Kiev would not go unpunished. “We want to warn Kiev and its Western sponsors that the losses incurred to the Russian side, the death of Russian servicemen, will not remain without consequences,” a ministry statement said. Foreign Minister Sergei Lavrov urged the West to warn Kiev against “dangerous steps that could have the most negative consequences” in a phone call with his French counterpart, the ministry said. Poroshenko had called Moscow’s claims “senseless and cynical”. “Fantasies are only another pretext for the next military threats toward Ukraine,” he said. Two residents living on the Russian-controlled side of the Crimea-Ukraine frontier told AFP there had been an unexplained build-up of Russian military hardware in the area over the past few weeks. Russia is holding nationwide legislative elections next month — including in Crimea — and the FSB said the alleged raids could be aimed at destabilising the situation ahead of the vote. A senior Ukrainian security official told AFP that Moscow’s claims were a “crude Russian provocation” and that Kiev was “getting ready for anything”, including an invasion. Russia says it has detained several Ukrainian and Russian citizens over the incident, including an alleged Ukrainian military intelligence officer named Yevgen Panov. Kiev has called Panov a “hostage”. Russian television showed FSB footage of Panov being questioned, with several cuts and bruises visible on his face and arm. He said he was recruited by Ukraine’s military intelligence, with the planned targets a ferry, a helicopter regiment, an oil depot and a chemical factory. Moscow and Kiev have been locked in a bitter dispute since the Kremlin seized Crimea in March 2014 after Ukraine’s Russian-backed president Viktor Yanukovych was ousted. The crisis sent ties between Moscow and the West plunging to their lowest point since the Cold War and led to tough economic sanctions by the European Union and the United States against Russia. The latest war of words represents the most serious increase in tensions in months as a separatist conflict in eastern Ukraine — that Kiev and the West blame on Moscow — drags on despite a stalled peace deal. 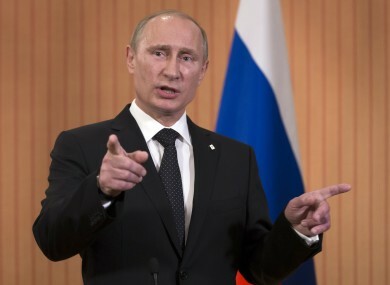 Email “Tension soars between Ukraine and Russia over 'terror attack' claims”. Feedback on “Tension soars between Ukraine and Russia over 'terror attack' claims”.